A Square digital receipt isn’t just any old receipt. It’s a powerhouse, packed with touchpoints for your customers to engage with you and your business. You can personalise the look and feel of your digital receipts in all sorts of ways. Start with your business name and logo to make it easy for customers to recognise your business — and their purchases — on their card statement. 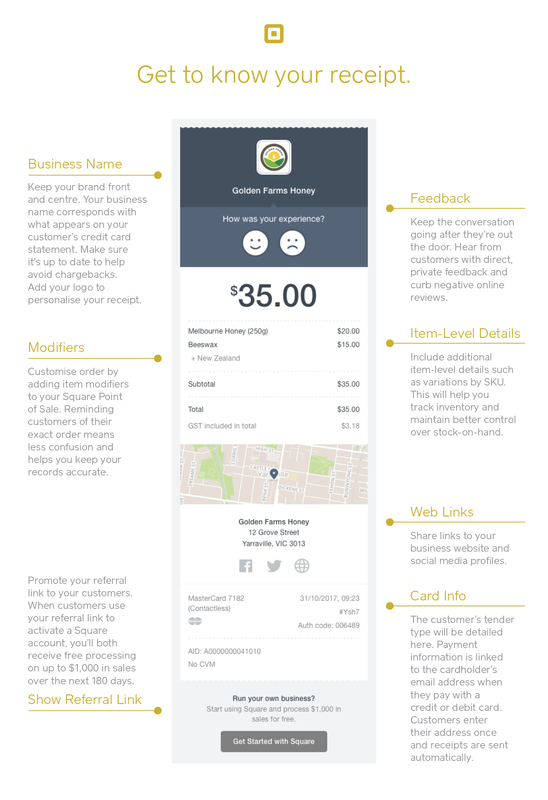 This will help minimise chargebacks and help keep your business secure. From there you can start to use your digital receipt as a tool to engage your customers and capture feedback. Include links to your social media and website to connect with your customers, and even add your referral link to the footer of your digital receipt — when a customer uses your receipt link to activate a Square account, you’ll both receive free processing on up to $1,000 in sales over the next 180 days.